Thermal receipt paper is treated with a chemical that changes color when it comes in contact with hot print heads. Therefore, no ink is necessary to produce clear text or images. This quality makes this heat transfer paper one of the most useful printing supplies. The substance will even react to friction: a fingernail swiped quickly on the paper will leave a mark. This white thermal paper roll measures 2-1/4 inches (57mm) wide and 150 feet in length. Each roll contains white BPA Free thermal paper. The roll measures 2-1/4 inches in diameter, has a 1/2 inch solid core and comes 50 rolls per case. This white thermal paper roll measures 2-1/4 inches (57mm) wide and 200 feet in length. Each roll contains white thermal paper. The roll measures 2-3/4 inches in diameter, has a 1/2 inch core and comes 50 rolls per case. This white thermal paper roll measures 2-1/4 inches (57mm) wide and 250 feet in length. Each roll contains white BPA Free thermal paper. The roll measures 2-11/16 inches in diameter, has a 1/2 inch solid core and comes 50 rolls per case. This white BPA free thermal paper roll measures 2-1/4 inches (57mm) wide and 42 feet in length. Each roll contains white BPA free thermal paper. The roll measures 1-5/16 inches in diameter, has a 1/2 inch solid core and comes 48 rolls per case. This white BPA free thermal paper roll measures 2-1/4 inches (57mm) wide and 60 feet in length. Each roll contains white BPA free thermal paper. The roll measures 1-7/16 inches in diameter, has a 1/2 inch solid core and comes 50 rolls per case. This white thermal paper roll measures 2-1/4 inches (57mm) wide and 80 feet in length. Each roll contains white thermal paper. The roll measures 2 inches in diameter, has a 1/2 inch core and comes 50 rolls per case. inches in diameter, has a 7/16 inch core and comes 50 rolls per case. This canary thermal paper roll measures 3-1/8 inches (80mm) wide and 220 feet in length. Each roll contains 1-ply white thermal paper. The roll measures 2 7/8 inches in diameter, has a 7/16 inch core and comes 50 rolls per case. This white thermal paper roll measures 3-1/8 inches (79mm) wide and 230 feet in length. Each roll contains 1-ply white thermal paper. The roll measures 3 inches in diameter, has a 7/16 inch core and comes 50 rolls per case. 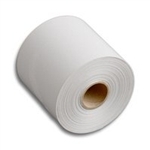 This white Phenol (BPA & BPS) Free thermal paper roll measures 3-1/8 inches (79mm) wide and 230 feet in length. Each roll contains 1-ply white thermal paper. The roll measures 3 inches in diameter, has a 7/16 inch core and comes 50 rolls per case. This versatile thermal receipt paper can be used in credit card terminals, POS paper printers, and cash registers. We provide thermal paper rolls in widths ranging from 2-1/8 through 4-9/32 inches. The paper fits a wide variety of machines: Epson, Nurit, Omni, Samsung, Sharp, Verifone, and more. Find our thermal paper in two colors: white and canary (the latter in a 3 1/8” width). POS paper is also available. We only carry BPA free thermal paper. It’s an economical, efficient, environmentally friendly way to generate receipts and records of transactions. And here’s another money saver: these products qualify for free shipping on orders over $500. Start shopping thermal paper products today!